The SV-A series, not only completely satisfies these basic requirements, but does more by offering users a number of additional benefits that were once unthinkable with a conventional viscometer..
A&Ds own technology is setting a new standard for viscosity measurement! Speed Accuracy User-friendly A&D’s highly sensitive, tuning-fork vibration viscometer*, the SV-A series, not only completely satisfies these basic requirements, but does more by offering users a number of additional benefits that were once unthinkable with a conventional viscometer. It is possible to perform viscosity measurements with sample liquid as small as 2ml (SV-1A). The sensors are made of titanium, which is anti-corrosive and resistant to various kinds of chemical substances. Fine position adjustment of the sample cup in three directions. This is especially useful when the sample cup is very small. Unlike the rotational viscometer, which requires several different rotors to cover a wide range of measurements, the SV-A series is capable of using the same, fixed sensor plates to perform continuous measurements from very low to high viscosity [SV-1A: 0.3..1000mPa..s (cP), SV-10A: 0.3..10000mPa..s (cP), SV-100A: 1000..100000mPa..s (cP)]. It is widely known that viscosity is very temperature dependent (–2~–10%/°C). The SV-A series has a temperature sensor (0~160°C) right next to the viscosity sensor plates,enabling users to easily monitor the relationship between viscosity and temperature. A water jacket is provided as standard to be used in conjunction with a commercially available constant heat water tank to heat the circulating system. This ensures that the sample remains at a constant temperature and that the temperature can be changed for viscosity measurement (0 ~ 100°C). The graphing program RsVisco receives the viscosity and temperature data from the SV-A series and creates a graph on a personal computer in real time. As such, changes in viscosity and temperature over time as well as the correlation between viscosity and temperature can be observed visually. Control the viscosity of resist liquids, inks, coating materials, adhesives, etc. Control the viscosity of abrasives for semiconductors, ceramic materials, etc. Measure the cure processes of polymers, soldering flux, proteins, and gelation point, etc. Measure viscosity variation due to changes in temperature of a lubricant, engine oil, food, etc. Quantify the physical properties of biological substances, such as blood, etc. The tuning-fork vibration viscometer has a pair of thin sensor plates of the same natural frequency, which are driven with electromagnetic force to vibrate at the same amplitude. The viscidity produced between the sensor plates and the sample liquid is detected based on the amount of electronic current required to drive the sensor plates and maintain them at a constant amplitude. 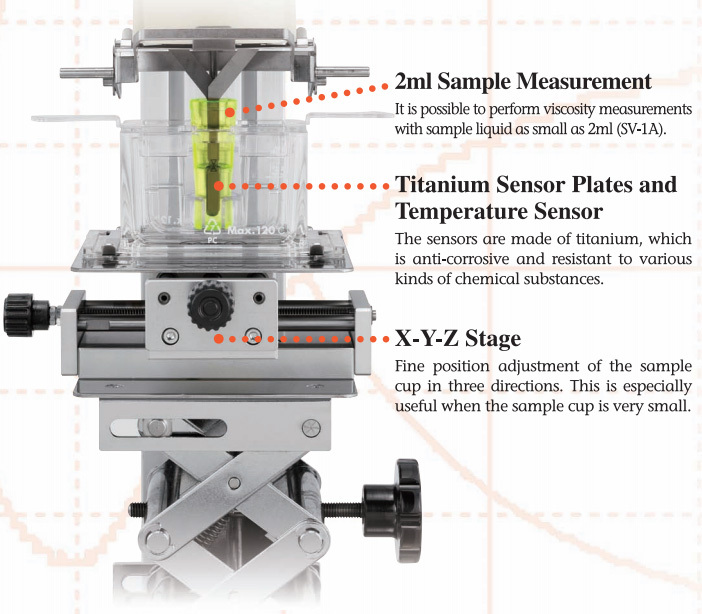 The sensor plates have very small thermal capacity and cause only minute displacement in the sample liquid, which prevents changes to the temperature and the physical properties of the sample. 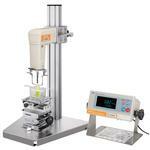 The initial viscosity coefficient will be indicated just 15 seconds after starting the measurement. The measured values will then be displayed in real time in response to the changes in viscosity. The SV-A series achieves an excellent repeatability of 1% of reading over its full measurement range. Both one-point and two-point calibrations are possible using either viscosity standard liquids (optional) or samples of known viscosities. Simplified Calibration function, a one-key operation that utilizes purified water is also available for the SV-1A/10A. Easy-to-read VFD for viscosity and temperature. Only 6 keys for simple operation. The sensor unit can be detached to perform measurements on location at a manufacturing factory, field research, etc. A portable carrying case is also provided as standard.